Interest in learning how to airbrush has reached a fever pitch, thanks to TV hits like Pimp My Ride, Sunset Tan, American Chopper, Trick My Truck, the new Car Warriors, and others. And there may be no better way to learn than at Airbrush Action magazine’s Airbrush Getaway Workshops. Celebrating their 23rd anniversary, the workshops will be staged this year at the Rio Suite Hotel, Las Vegas, Monday, October 17th, through Friday, October 21st. All of the one-day introductory courses will take place Monday to prepare for the following four-day hands-on seminars: Ultimate Airbrush Effects and Techniques, Airbrush Mastery, Achieving Photorealism, Automotive Graphics, Automotive Murals on Steel, Airbrush Tanning, Makeup, and Body Art, Power Portraits, Wildlife Art, Pinstriping Mastery, Power Skulls, and T-Shirt Airbrushing for Fun & Profit. The courses will be conducted by some of the world’s top talent, including Terry Hill, Dru Blair, Jerry Ott, Javier Soto, Ryno (of Speed Channel’s Car Warriors), and other well-known artists. Sponsored by Auto-Air Colors, SEM, Iwata Airbrush Company, Artool, and Anest Iwata, the Airbrush Getaway Workshops launch careers by teaching how to profit handsomely in art despite self-perceived artistic limitations. A one-day introductory course is $150, a four-day course $575 ($50 is discounted if you take both). Classes include all the necessary equipment, materials, and supplies (airbrush, air source, substrates, paint, etc) at no extra cost. Group and alumni discounts also available. 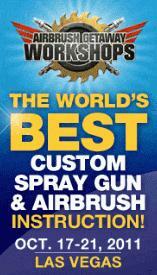 For more information call 800-232-8998 (732-223-7878 for international callers), or go to Airbrush Action. Make 2011 the year that you catapult your airbrush skills into the next dimension. Don’t miss the opportunity to learn from the very best in an atmosphere that is beyond compare. 2011 Ultimate Air Affair artists: Craig Fraser, Bob Soroka, Mike LaVallee, Pamela Shanteau, Steve Driscoll, Jason Doll, Darren Wenzel, Gerald Mendez and Steve Vandemon. Register for the Ultimate Air Affair today. We would like to thank all who have contacted us and offered support and prayers for those affected by the tragic events in Japan. As the subsidiaries of our Japanese parent company, this horrible situation has affected us all quite deeply. As of today all of our employees and families in Japan are safe and moving forward in dealing with the aftermath. The following is an update of the situation as it pertains to ANEST IWATA USA, Inc., ANEST IWATA Air Engineering, Inc. and its customers. Our factories have secured running water and basic necessities and are capable of production. However, our factories and all of Japan will still face many challenges ahead and one of them is electrical power supply. With trying to provide enough electrical power for search and rescue teams and critical hospital necessities, everyone in Japan is being asked to ration electricity and use minimal power. Another situation that affects us is transportation and logistics. Currently supply to and from factories is moving at a very slow pace. Our hope is that the situation will continue to improve in the weeks and months ahead. Going forward, while certainly some situations out of our control may arise, please be assured that we will tirelessly strive to overcome those obstacles. We want to confirm that our commitment to our customers remains unchanged and we will continue to provide ANEST IWATA equipment with little interruption. Currently ANEST IWATA USA, Inc. and ANEST IWATA Air Engineering maintain healthy inventories and should have minimal problems supplying equipment. We all greatly appreciate your understanding and support in getting through this difficult and challenging time and once again thank you for all the heartfelt concerns and worries for our families, friends and partners in Japan. ANEST IWATA Air Engineering, Inc.
As of April 1, 2011 ANEST IWATA USA, Inc. will be relocating to our new facility. Our new facility will triple the amount of space we currently occupy. Our phone numbers and emails will remain the same. Please update your contact information to reflect the new address. We are also excited to introduce our latest division in North America; ANEST IWATA Air Engineering, Inc. ANEST IWATA Air Engineering, Inc. responsibilities include air compressors, vacuum pumps and nitrogen generators featuring our innovative oil free scroll technology. As divisions of ANEST IWATA Corporation, ANEST IWATA USA, Inc. and ANEST IWATA Air Engineering, Inc. will be operating under one roof. ANEST IWATA USA, Inc. will continue to supply the worlds leading innovative spray technologies within coating markets working along side ANEST IWATA Air Engineering, Inc. for compressed air related technologies. Once again, thanks to all who utilize and support ANEST IWATA products. ANEST IWATA USA, Inc. would like to confirm the following spray guns comply with EPA NESHAP 40 CFR, Part 63 Subpart HHHHHH HVLP and Compliant rule. The transfer efficiency of all listed guns is 65% per local air district mandates provided each particular gun is set-up by the user with the recommended inlet pressure and spray distances in each particular spray gun instruction manual. If you have discarded you instruction manual you download it from within our website. Since many customers have requested transfer efficiency data for our LPH400 and our W400LV spray gun’s, we are supplying a link to the EPA’s ETV program (Environmental Technology Verification Program) where this data can be downloaded. ANEST IWATA USA is proud to supply some of the most environmentally friendly spray equipment in the industry. If you do not know or no has informed you, yet the EPA has new requirements to reduce air pollution of metals such as chrome, lead, cadmium, manganese and nickel compounds, and to reduce methylene chloride fumes, from autobody refinishing work. The new rule is Regulation 40 CFR Part 63 Subpart HHHHHH. For more details and assistance, please talk to your local environmental contact. 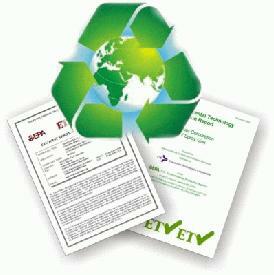 Since many customers have requested transfer efficiency data for our LPH400 and our W400LV spray gun’s, we are supplying a link to the EPA’s ETV program (Environmental Technology Verification Program) where this data can be downloaded. You can also visit to read a brief summary of the ruling. If you have any questions regarding training or certification, please contact your local ANEST IWATA dealer or representative. ANEST IWATA USA would like to extend regards and thanks to all who visited our exhibit during the 2010 SEMA show. This year we showed the whole picture of how ANEST IWATA, Iwata-Medea and Artool products impact the automotive market from Manufacturing to OEM Equipment to Automotive Refinish to Kustom. The whole lifespan of a vehicle is impacted by what we bring to the table. SEMA took on a whole new look with a Kustom fabricated booth that was constantly filled with loyal customers and new customers that didn’t realize all the products we bring to the table. 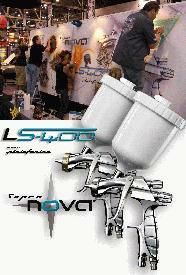 This year’s feature was our new gun SUPERNOVA LS400H Hybrid spray gun. The gun is setting the benchmark for spray guns matching HVLP compliance with Conventional speed. Iwata-Medea displayed there new Maxx-Jet mobile air compressor that makes it easier than ever to take you art on the road. Rounding out the show was Artool and their latest Radically Original templates. We also want to everyone from all three companies for their contributions to making this happen and bringing out the industries best and brightest influences in and around our booth. Once again, thanks to all who utilize and support ANEST IWATA, Iwata-Medea and Artool products. ANEST IWATA USA, Inc. participated in the 2010 International Woodworking Machinery & Furniture Supply Fair-USA®. Visitors from over 80 countries and all 50 states were in attendance at one of the largest woodworking trade shows in the world. 972 companies were on hand exhibiting with over 800,000 net square feet of product displays. ANEST IWATA showcased our industrial line of equipment including our new Glazing Gun, 2 gallon dual regulated commercial pressure pot and our Waterborne electrostatic gun. We also had on hand our 13:1 air-assisted airless system with the new MSG200B spray gun. This system provides a great solution for waterborne stains and topcoats. Some of the other highlights were our double diaphragm pumps and extension guns. Although the show as a whole didn’t set any attendance records, we noticed steady booth traffic and a more motivated buyer profile. With the hard economic times facing the industry, the companies visiting IWF kept the travel numbers down and only sent users and decision makers. This made for a very satisfying show experience for our employees and our distributors across North America. 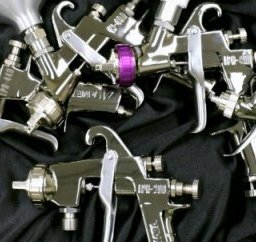 In recognition of ANEST IWATA’s 85th anniversary, we have designed a limited edition spray gun with each gun individually numbered for authenticity. We teamed up with Charley Hutton for this gun. As one of the premier painters in North America Charley is known for his custom paintwork on high-end street rods including two prestigious Ridler Awards, several Street Rod of the Year and Custom Rod of the Year. 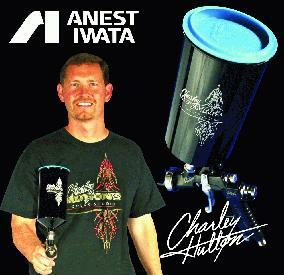 Check out ANEST IWATA’s 85th Anniversary limited edition Charley Hutton spray gun’s official release during the ASET Ultimate Air Affair Kustom painting event in Salt Lake City, Utah August 25 – 28. 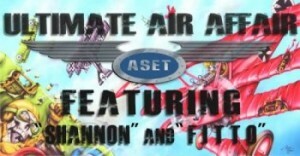 To find out more information about the Ultimate Air Affair Kustom painting event or to participate please contact ASET at 800-628-5449. As always, we thank you for your loyalty and continued support of our brand and we hope you enjoy the most advanced atomization technology in the world. 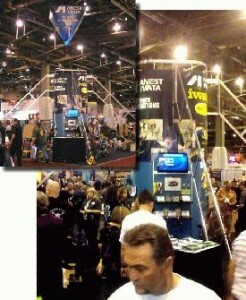 ANEST IWATA USA would like to extend regards to all who visited our exhibit during the 2009 SEMA show. This year during the annual automotive aftermarket industry week in Las Vegas ANEST IWATA we concentrated our efforts at the SEMA show. Coordinating our efforts with our sister company Iwata-Medea always brings out the industries best and brightest influences in and around our booth. This years feature was our new SUPERNOVA spray gun and to watch the best kustom airbrush artist’s show their talents and let you in on some of their tricks of the trade. Once again, thanks to all who utilize and support ANEST IWATA products and a special thank you goes out to everyone who helped.